The arcade classic game hire is one of the most popular attractions we have. There are a multitude of games on this console, all the old favourites, pacman, space invaders and asteroids to name a few. The upright cabinets house around sixty games. 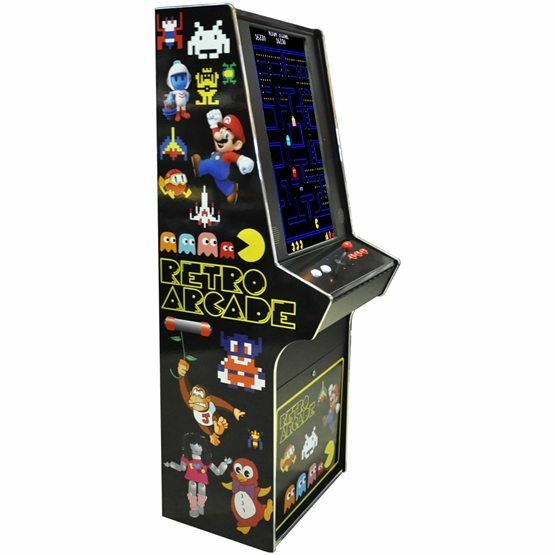 We hire arcade classic games to a wide range of clients from company parties to house parties, these upright cabinets are quite compact and will fit through a single door. The ”arcade classic game hire” will show todays children what the games used to be like, with their very basic graphics compared to the latest interactive video games. The arcade classic game hire will have something for everyone, they are all set on free play so guests can play as many times as they wish. The upright cabinets look great with the retro graphics and modern finish. The arcade classic game is a great addition to any party. The retro arcade game is great fun, playing all the games when video games first came out. We hire retro arcade game fun to many parties and the older style games are making something of a comeback. The retro arcade machines are great fun to play even with their very basic graphics – but these were great when they first came out. We hire retro arcade machines throughout the UK and hire amusement machines to many customers. The arcade machine is a great attraction at parties and events. The amusement arcade machines are available in a wide range of styles, and we will have the right amusement arcade games for every event. The arcade machine will really be a hit at your next event. The arcade game hire is great fun at parties. The arcades games hire will really add fun to your next party. The arcade machine hire is great fun for guests. We hire arcade machines throughout the UK. Arcade classic game hire is available throughout the UK and they are always very popular. We have the full range of arcade games and some clients hire a few of these games so their guests can play different games on each machine. We also supply all the driving simulators so if you are looking to turn your venue into and arcade we will have just the games for you. As a well-established entertainment agency we also have all the fun indoor games and can supply all your theming requirements, acts and entertainers. We really are the one stop entertainment shop. Call our experienced sales team for great advice for your next event. The arcade classic game hire is great fun for all guests.